Building on right is the Brick Schoolhouse on Nichols Street built 1862. Personal Note: When this brick building on the right was torn down by my uncle, Norman Kull, he saved the bell that was used for calling classes. 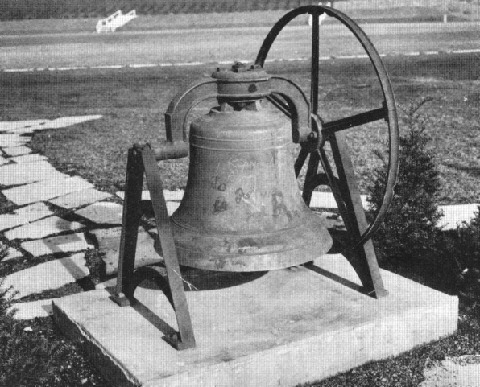 He later donated the bell to the new football stadium where it stands today. The tradition is to ring the bell to announce the sports victories to the town after a game. John Zamecnik, who shared many photos with me, remembers going to classes here. As a young boy he enjoyed ringing the bell for beginning of classes. High School - Built 1909-10. It offered a two-year high school course. In 1911, it became as a three year course. 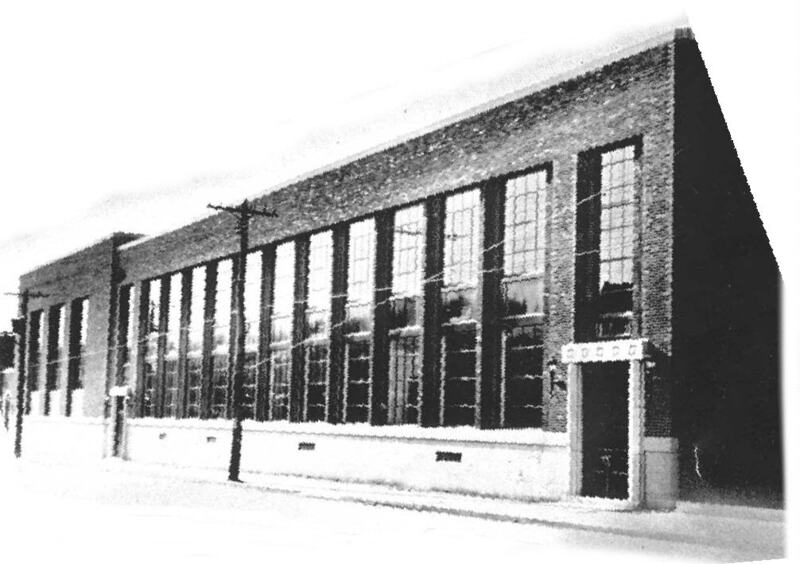 In 1922 the North Nicholas Street high School building was completed, and a four-year high school course was offered. Picture taken September 1982 my son's (little guy next to yellow raincoated person) first day of school, 1st grade. 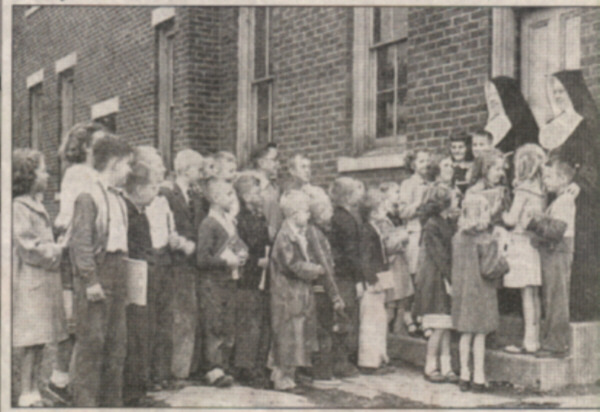 In 1893 the first parochial school was established by the St. Boniface Parish, it closed on June 18, 1953. . 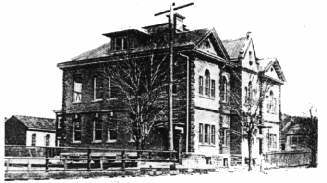 In 1914 St. Mary's Roman Catholic church constructed a $30,000 school building. St. Mary's school closed in the mid-1980's. Take a look at the Saint Clair Web Site GUEST BOOK. Here is an entry many would be interested in. Comments: Hello, champions of 1932. This is Miss Ray. Today is my 94th birthday and I am going strong. Would love to hear from former students. 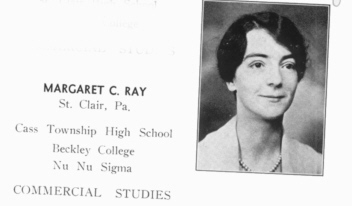 I taught at SCHS from 1928 to 1944. Information below that has been passed down about this clock, seems to not be historically correct. "This clock was originally made for William Herbert, Earl of Pembroke in honor of his wife, the Lady Margaret. 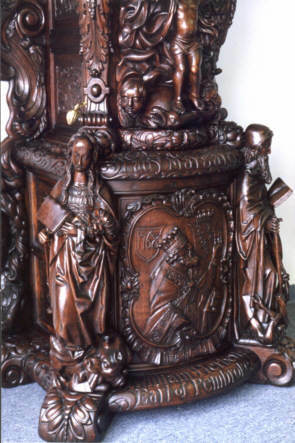 He employed skilled workers from many parts of Europe to carve this wonderful memorial for her. Work began in 1718 and continued for half a century." "Ten figures and fifteen faces have been carefully cut in the heavy oak. The figures represent Arabian and Egyptian astrologers in various attitudes, an the faces are those of little children. The smallest detail is realistically copied in these models. The names of the Earl and his wife are also carved across the front of the woodwork. Upon the face of the clock are two silver hemispheres showing the phases of the moon. Four dials tell the day, the week, the month, and the year. Chimes mark all the quarters of the hour. The clock plays seven pleasant tones. A brass pendulum with a face like the Man in the Moon is suspended from the mechanism. 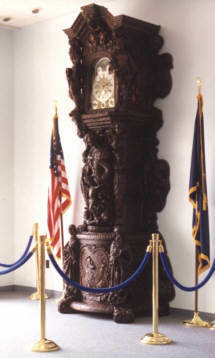 The clock was imported to the country by Mr. Taylor, owner of the Saint Clair Coal Company, who purchased it directly from the Earl's estate. He was allowed to bring it through Custom's Appraisers free from duty--because it was a genuine antique. It was exhibited at the Chicago World's Fair in 1890. Chicago World's fair was in 1893. 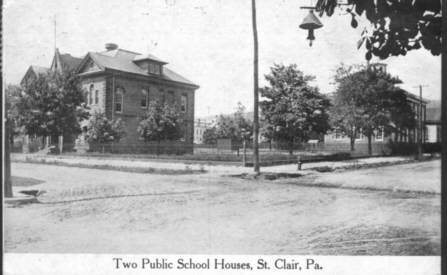 In the late 1920's, Mrs. Taylor, a great patron of the schools of Saint Clair, presented the clock to the school." 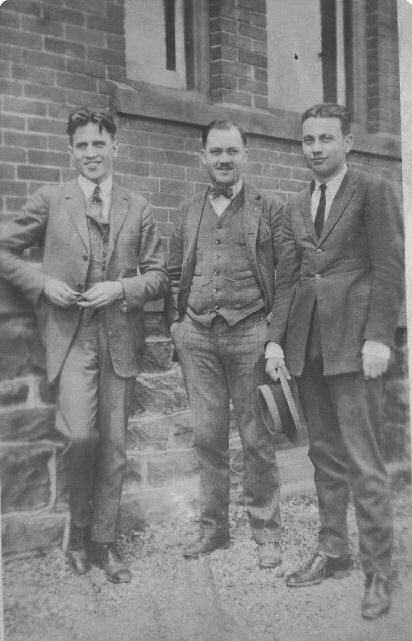 Mr William H. Taylor died in February 1928. His wife was Nellie Grace Barker Taylor who died in 1939. Mr. Taylor was educated in the public schools of Patterson, NJ. He was one of the largest individual anthracite coal operators in Pennsylvania. Anyone who went to the Carroll Street school will remember this large clock that towered above the stage in the auditorium. The clock stood there still when the auditorium was turned into a gymnasium! When the Carroll Street School was closed the clock was sent out to be restored. It now has it's place of honor in the newly remodeled Elementary/Middle School in Saint Clair. This is the school built in 1938 as a High School. Saint Clair no longer has a High School. When students graduate 8th grade they are sent to neighboring Pottsville Area High School to complete their High School education. Once again the population in Saint Clair is expanding and additions are being made to the Elementary/Middle school...again. 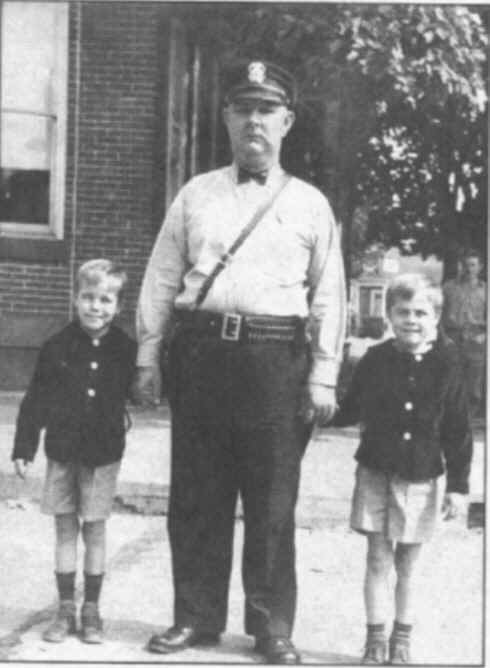 Klemmer twins crossing the street with the aid of Captain Morrow on way home from school. 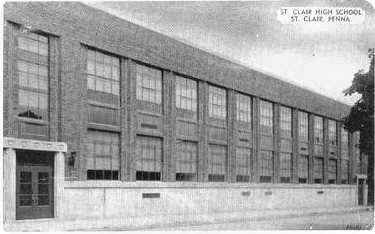 With 1988-89 came the last High School class to graduate from Saint Clair. 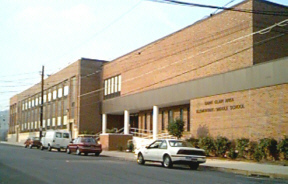 The building that was constructed in 1938 was renovated and changed into a Elementary School, Middle School students were bused out of Saint Clair to the Blythe school and High School students to Pottsville Area High School. 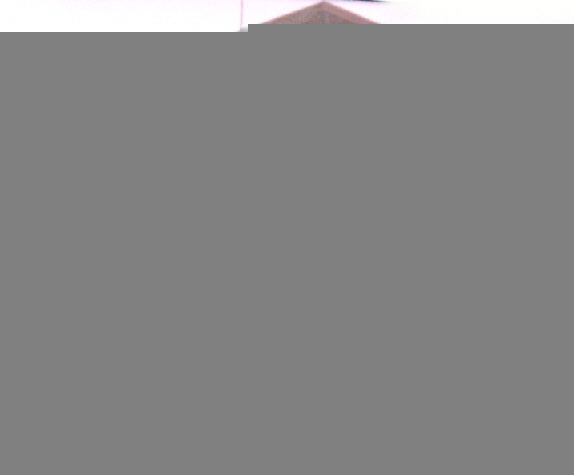 Today Kindergarten to Eight Grade students attend this school. When students graduate the Middle School they finish their schooling at Pottsville Area High School for their 9th to 12th grades.